Hotel Levante, Rimini. Levante Hotel Rimini. 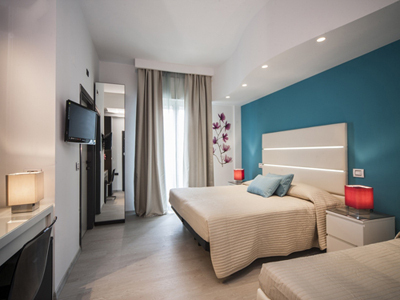 Welcome to Hotel Levante, an elegant family-run four star hotel at a short distance from the sea, in the heart of Rimini in the area Marina Centro. Hotel Levante put itself as a perfect base for an entertaining holiday but at the same time a relaxing location ideal for families and young people thanks to services offered and to the position in which is set the hotel. Our restaurant, equipped with a panoramic sea view, offers every days very good recipes from Romagna tradition besides classical international specialties. À la carte menu, rich and tasty buffets, our wine cellar and buffet breakfasts characterize the excellent service of Hotel Levante. Our guests will spend pleasant moments enjoying excellent cocktails in the elegant bar area whereas our business clientele will use our meeting rooms able to satisfy all your business meeting needs. At just ten metres far from the hotel you can reach the beach with bathing hut, playing field, a well equipped gym. Rimini offers entertaining ideas also for youngest.. closeness to Hotel Levante you will find Italia in Miniatura (Little Italy), the dolphinarium of Rimini and Riccione, and the parks Acquafan and Mirabilandia.